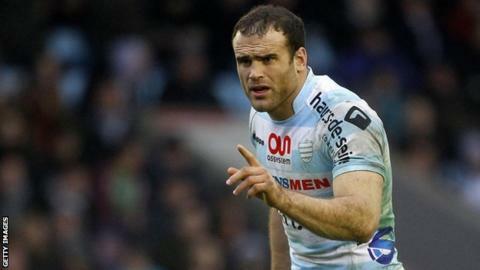 Wales coach Warren Gatland says the Welsh Rugby Union has not "instigated contact" aimed at bringing Wales stars Jamie Roberts, Mike Phillips and Dan Lydiate back from Racing Metro. Reports in France say the players could leave Racing, who say they have spoken to the trio about the possibility. Gatland said: "We haven't instigated contact with the players. "But we are aware that one or two of them are keen to return to Wales sooner rather than later." Racing coach Laurent Labit told French newspaper L'Equipe: "We have raised the subject [leaving] with them. They have never really been that effective since their arrival." The Paris club declined to make further comment when contacted by BBC Sport Wales. The agents of Lydiate, Roberts and Phillips have been asked to comment, as have the WRU and Regional Rugby Wales, which represents Newport Gwent Dragons, Ospreys, Scarlets and Cardiff Blues. Gatland's comments came separately in a WRU online question-and-answer session. Centre Roberts and flanker Lydiate joined Racing ahead of the 2013-14 season while scrum-half Phillips moved there in December 2013 after being dismissed for disciplinary reasons by former club Bayonne. If they had wanted to play for potential new teams at the start of this season's European competitions on Friday, the trio would have had to have moved before 12:00 BST on Tuesday 14 October. And if they play in the European Rugby Cup at all for Racing Metro - who host Northampton on Saturday in their European opener - the players will not be able to represent another team in the tournament this season. Any proposal by the WRU to bring the players back to Wales is likely to meet scrutiny from the nation's regions. The WRU and the four regions - Dragons, Ospreys, Scarlets and Blues - ended a long-running dispute with a £60m deal in August. That agreement included a total of £3.3m set aside for dual contracts which mean the WRU pays 60% of some leading players' wages with the regions funding the rest. Wales captain Sam Warburton is the only player on such a deal. However, Dragons chief executive Gareth Davies afterwards said the WRU-regions deal should not necessarily be used to bring back players from abroad. Davies has since been elected to the WRU board and may bid to succeed the deposed David Pickering as chairman. It is understood that the regions are arguing that dual contracts should be prioritised for Welsh-based players and emerging talent rather than players who have opted to play outside Wales.